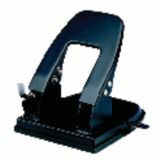 Black enamel finish, non-skid bases, removable chip traps and accurate built-in centering guides. 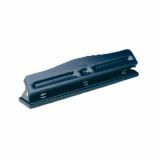 2-Hole Punch has 2-3⁄4" centers. 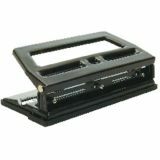 Black enamel finish, non-skid bases, removable chip traps and accurate built-in centering guides. 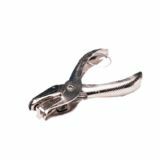 Fully adjustable and convert to a two-hole punch with built-in neutralizing center head. Punches up to 40 sheets of 16lb. paper. Convenient hand-held use with hinged chip catcher. 1⁄4" hole diameter.